So I forgot to mention that I got some more books on here the other day. I know I was posting up some pictures on my Twitter but I’m here now to show you my lovely new books! Yes, you’ve heard correctly. 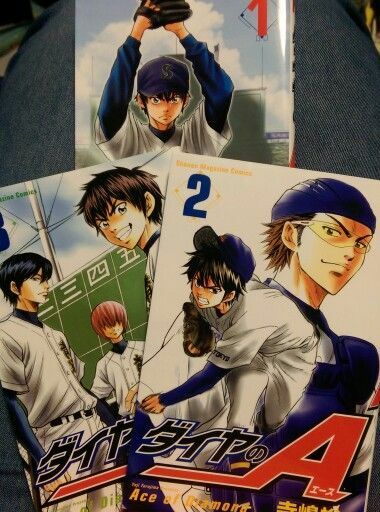 I’ve started to collect the Diamond no Ace books, and just the other day I went to pick up the first three volumes (the lady forgot to jot down volume 4 so it didn’t come in…). And when I picked up this batch, the first thing I did was browse through them and fangirl over Miyuki! Isn’t it beautiful?! 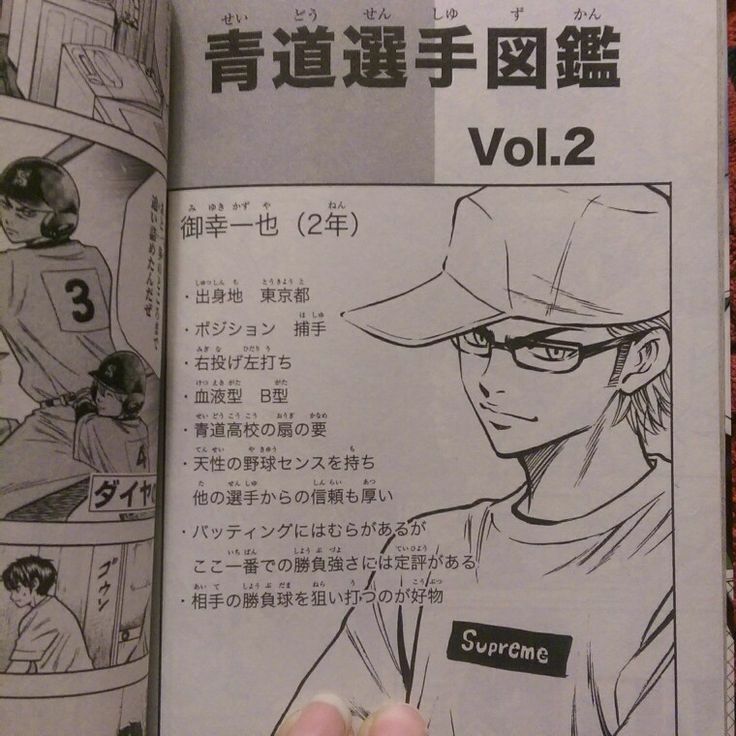 And it’s pretty short so in my little Miyuki obssessed mind I thought, I can totally translate this. It’ll probably be bad but I can do it! innate disposition to baseball sense have….has good sense and an innate disposition to baseball? o_o basically…he’s awesome! This makes zero sense, right? Gosh, just looking at my notebook makes me dizzy, like, where do I look first?! But I’m going to leave it here in case anyone wants to peer into my messy sketchbook. I decided to put this in my sketchbook because it has no lines, so I don’t have to worry about the size of my letters. And if you’re wondering how to read this, the second picture is actually where I started. After that I migrated to the first picture. It’s my way of keeping things together without having to flip the page so many times. Pardon my very sloppy handwriting. I don’t usually have bad handwriting…just 97% of the time. **Drum Roll** Now it’s time to reveal what Miyuki’s character profile actually said. Or at least a much better and accurate translation by the amazing and wonderful small person named LYN! He has a natural sense for baseball. He has a trust and faith for his teammates. When Mura is up to bat, his established mindset is that he will use all his strength and power regardless of whether they win or not. I’d also like to comment that the last point is really amusing because in the few episodes that I’ve watched from the first season I’ve seen him do that a couple times. And. It’s. Awesome. Ah, this was so fun but also very exhausting. I don’t think it is that progressive. When it comes to translating anything in a different language, it is difficult. I mean I have a long way to go too. Yeah I understand that. Its a step by step process, though sometimes when the going gets tough in learning a new language I tend to forget that, haha. >>While his batting is inconsistent, he is recognized as a clutch batter who can rise to the occasion. >>His favorite thing to do is aiming and hitting his opponent’s best pitch. >>He has a prodigious sense for baseball, and the other players very much trust him. Wait, “natural sense” is correct not “prodigious.” I misread that as 天才, sorry.